We are engaged in offering Solvent free Adhesives. CPU 100 BC (NCO) 2000 + 500, 40 °C 99 + 1 Solvent Less Two Component PU Adhesive System, used in the Ratio of 10060 Parts on High Speed m/c's like Nordmeccanica for Film to Film / Al Foil Lamination. Gives Good Bond Strength with Speckling Free. Result at 2 - 2.5 gsm coating. 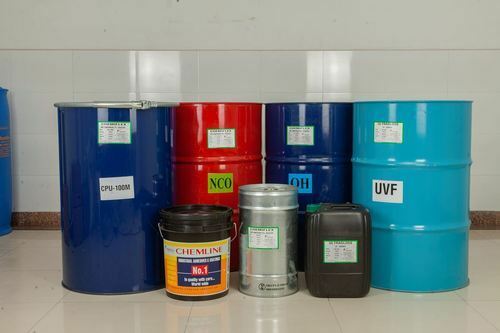 We are an ISO 9001:2000 Certified Company engaged in manufacturing, supplying and exporting a wide range Coatings, Packaging Products and Hot Melt, Labeling & Dry Adhesives. The range offered by us encompasses Dry Lamination Adhesives, Wet & Dry Lamination Adhesives, Rigid Paper Boxes, Thermal Lamination Films, Adhesives for Gutka Pouch, Animal Jelly Glues, Protective Films and Quiktack BOPP Packaging Tapes. In addition to these, we supply and export Hot Melt Adhesives for perfect book binding & carton sealing. The labeling adhesives that we offer are widely used as an identity maker in different industries such as pharmaceutical, distilleries, food and wineries. All the products offered by us are widely appreciated by the clients for their inexplicable look, high sticking strength, easy removal and effective resistance from scratches. Our qualified team of professionals makes optimal utilization of the resources present at the premises to manufacture the excellent range of products. In order to provide flawless products to our customers, we constantly employ the advanced technology in our trading activities. Besides these, we confirm that the orders are delivered to the customers within the promised time frame. Due to all these reasons, we have been able to muster a huge client base in the markets of the Middle East, Europe, Latin America, North America, South East, Asia, North-west and Africa. Our strength lies in providing quality and timely service to our customers and by obtaining new products through innovation. “Progress through Innovation” is the motto of Chemline. We spare no efforts to develop a product, maintain or upgrade the quality and provide custom-built products as per the needs of the customer, and working as per ISO-9001 quality system remains the prime concern of Chemline.